Mining giant Xstrata has said it is paying almost $3bn (£1.9bn) to take over its Australian rival MIM Holdings. The deal will be partly financed through a $1.4bn (£900m) fund-raising exercise. 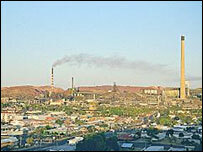 Xstrata said the takeover will boost its earnings almost immediately and predicted cost savings of $45m from the deal. Meanwhile MIM's chief executive Vince Gauci said he did not think the offer price was high enough. But he said most of the other board members supported the proposed acquisition and would be recommending it to shareholders. Xstrata said the acquisition will provide what it called "meaningful entry points" into new copper and metallurgical coal markets. Chief executive Mick Davis said the deal was part of its long term growth ambitions. "It is wholly in line with our strategy, outlined at the time of our IPO (Initial Public Offering) last year, to leverage Xstrata's size and momentum to build a distinctive, value-focused, diversified metals and mining company." Xstrata said it expects to complete the acquisition by mid-June.